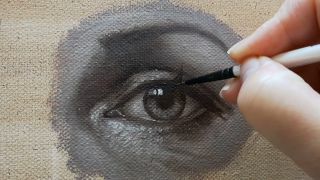 This step-by-step tutorial has advice for creating realistic eyes using oil paint. The eyes are the most important element of any successful portrait, but many people struggle to draw them correctly. In this article, I will run though some tips for painting sparkling human eyes, with the focus on achieving a realistic effect. I’ll teach you about the importance of judging values and observing the anatomy of the eyes so that your portraits can come alive. I've also included some videos to show you exactly how I do things. If you'd like more tutorials on drawing animals, landscapes and people, see our how to draw tutorial roundup. Although it may not seem important, it is crucial to avoid working on a white canvas. I recommend tinting the canvas with a wash that is a mixture of thinner and any oil paint (in this case, burnt umber). This is to help you judge values more efficiently. It also eliminates the natural fear of putting the first brushstroke onto a clean surface. a round ball with an iris, covered with a cornea shaped like a dome. The eyelids have thickness as well and they will form shadows on the white and iris of the eye. To block in first colours or/and values, you need to try to look past the details that will always try to grab your attention. Squint your eyes and block in similar adjacent colours and values in one go. Don’t worry, this is only a base for the details that will come later. Pay no attention to eyelashes and wrinkles. Think big. Now is the time to start adding details. If you blocked in the base colours properly, you will now only need to worry about refining details and adding paint where it will make a difference. Adjust shapes and apply textures. Don’t overdo it though – it is easy to forget yourself and render too much. Paint only what you see and not what you think should be there.